As you probably know, the Earth is comprised of layers. At the center of the Earth is the molten metal core, surrounded by the rocky mantle and then the outer crust. This outer crust is mostly comprised of rock, with a thin layer of soil, sand and loose material on top of it. The point where the rock is still a solid mass is called the bedrock. 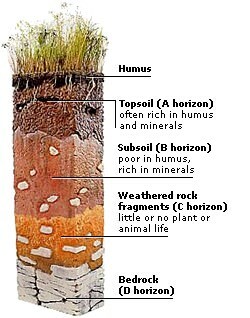 In many situations, the bedrock layer is many meters down, but in places where there’s erosion, the bedrock can be exposed to the air, so you can study it. Geologists use bedrock as a kind of book, to study the history of a region of the Earth. The kind of rock that was deposited, or how it has been weathered tells geologists a lot about what processes happened to create this area. They can see how the bedrock was tilted through plate tectonics, or the chemical constituents of the lava that formed the original rock, or what kinds of process occurred in the area since the rock originally formed. The depth of the bedrock changes from place to place on Earth. In some regions, the bedrock is right at the surface, exposed to air. In other places, it might be hundreds of meters deep, beneath loose sediments and broken rock. A large chunk of rock at the surface, detached from the bedrock is known as float. Sometimes it’s difficult for geologists to know if they’re actually looking at the bedrock or a piece of float. Bedrock can be made of all the 3 types of rocks: sedimentary, igneous, and metamorphic. Bedrock is extruded from the Earth through volcanic events, and can last for hundreds of millions or even billions of years. In certain kinds of fault lines, one tectonic plate travels underneath another – the bedrock is returned to the interior of the Earth. We have written many articles about the bedrock for Universe Today. Here’s an article about the exposed bedrock on Mars, and here’s an article about the regolith. If you’d like more info on the Bedrock, check out the Soil Forming Factors, and here’s a link to the U.S. Geological Survey Homepage. We’ve also recorded an entire episode of Astronomy Cast all about Plate Tectonics. Listen here, Episode 142: Plate Tectonics.